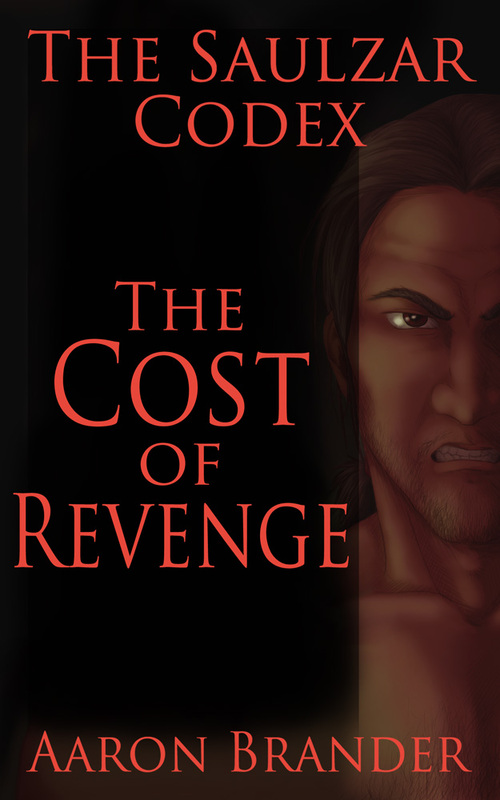 I’m happy to announce that The Cost of Revenge is available! It is the fifth chapter in the Saulzar Codex – a series of short stories focusing on Saulzar, a fierce warrior battling to overcome his own past. You can learn more about the project here. I’d love for you to stop by and pick it up. It’s a short story at 8500 words and is priced at $0.99. His stomach grumbled so loudly that the person next to him turned and said, “Excuse me?” just before Saulzar bumped into her. The old lady looked at the disheveled youth with a disapproving eye, casting aspersions upon his windswept hair, grimy face, and mischievous smile, while wishing her withered old bones still held the spark of life that bubbled forth from the child. Saulzar thought none of those things. He saw a gray-haired woman who had no idea what fun was. He stuck his tongue out at her and jogged away, darting through the crowded market with all the grace and arrogance that a boy can possess. He turned a corner and rifled through the small leather bag he had snatched when they collided. He found a couple of small coins, a scrap of cloth and a piece of string. He tossed the bag away and pocketed the coins. His stomach growled again as he merged into the market crowd. The coins could buy fresh fruit or a few candied nuts, but Saulzar had plans for the money. He was going to buy a knife. He stopped at the next stall and looked with envy upon his future possession. It had been months since he first saw the serrated knife with the wolfshead hilt, and he was happy that it had not sold. The first time he saw it, it resonated with him. He asked the shopkeeper if he could see it. The shopkeeper took the knife out for Saulzar to see. Saulzar asked how much it was and choked on the price. He may as well covet a prince’s palace for all the likelihood that he would own it. Yet a week later, it was still there, so Saulzar began to hoard his money. He pestered Farsha Kordi, his guardian, for odd jobs. Farsha relented, and Saulzar spent all of his free time dusting the house, sweeping the floors, and cleaning their dishes. He also spent the days skipping out on his education and finding money in the market. He had a skill for making money disappear from one person and appear in his own hand. And now, with the money he lifted today, he was only ten danir from his goal. “Do not sell that knife. I will be back for it next week,” Saulzar said. “I have tried hard to sell it all summer, and yet no one will buy it. Perhaps you are meant to have it, eh?” the shopkeeper said with a sly smile. “I am,” Saulzar said before melting into the crowded market. His stomach rumbled again, and he realized he had not eaten all day. He looked at the nearby stalls while standing on his tiptoes. He was tall and strong for his age and the added height was enough for him to see over most people. Men in traditional Nizwi head scarves and white or black robes roamed the markets looking for books and jewels and slaves. Throngs of veiled women in flowing, colorful robes toured the market, trailing servants who bought the produce, meat, and spices for the evening meal. Saulzar slipped in among the servants of a petite Nizwi woman who barked orders at a large, bald man. He then hissed orders at the trailing servants who darted from the pack to buy goods before returning to the ranks. Saulzar had watched these roaming packs of servants with awe and trepidation when he first came to Sol. It had not taken long for him to learn that he could slip among them, and amidst the chaos of the negotiations, steal away with food for himself. A servant behind him made a run for a stall full of apples, papaya, coconut, and bananas, and Saulzar followed in her wake. As the list of needs was read, and the stall owner bent over backward to meet the demands, Saulzar nicked an apple and a banana. When the servant left, Saulzar fell in behind her.